President Donald Trump’s proposed budget for 2019 could bring big infrastructure changes to Missouri, but local engineering and commerce experts say it could be hard for the state to compete for federal dollars. The budget promises to “generate $1 trillion in infrastructure investment” by dedicating $200 billion over 10 years to projects like improving roads, expanding internet access in rural areas, and developing creative approaches to transit, energy, water and building. Of that, $100 billion would be awarded as competitive grants to states and local governments who pursue projects “demonstrating innovative approaches” to infrastructure. The renewed focus on projects like failing roads, bridges and rails could lead to necessary improvements, according to Marsia Geldert-Murphey, who directs Missouri’s chapter of the American Society of Civil Engineers. But Missouri might not have the money to actually secure these federal incentives. Missouri has about $825 million of “unfunded transportation priorities” each year, according to a report released in January by the Missouri Transportation System Task Force, a 23-member bi-partisan research group made up of state House and Senate members, as well as people in the executive branch and private sector. 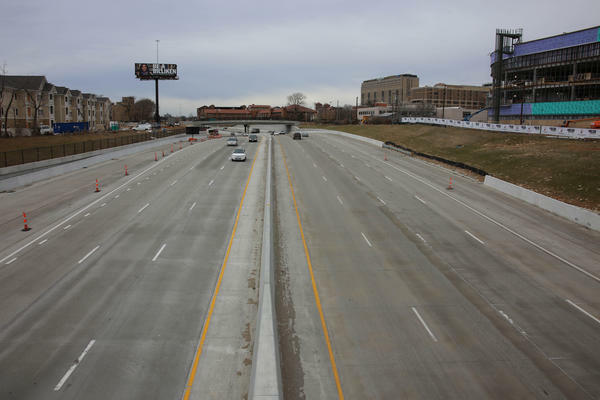 The state has also struggled to match federal funds on highway projects. “If this split puts a greater onus on the state, we don’t have a sustainable system in place right now,” Geldert-Murphey said. The federal government currently contributes up to 80 percent of the cost for highway projects. Other mass-transit projects receive around 50 percent. The new budget requires states, and local governments, to develop public-private partnerships and compete for federal money. Public-private partnerships have led to improvements in St. Louis’ infrastructure, said Hart Nelson, vice president for public policy at the St. Louis Regional Chamber of Commerce. He points to the replacement of the Merchants Rail Bridge, which runs over the Mississippi River, as one example of a much-needed project funded in part through private aid. But Nelson also said that smaller cities like St. Louis might not be able to compete for the limited federal grants provided by the $100 billion budget. Even if Missouri and its cities could secure federal grants, Geldert-Murphey said that the proposal doesn’t go far enough. The president’s infrastructure proposal is far from being finalized. Congress must still draft and pass spending bills based on the budget requests. In fiscal year 2018, parts of the proposal did not make it into law.